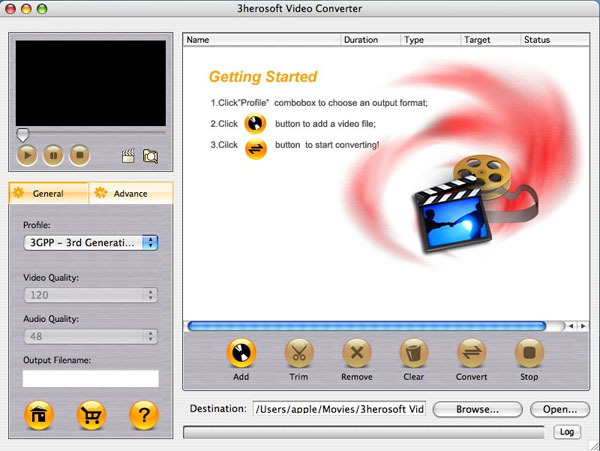 3herosoft Video Converter for Mac supports so all-around video formats such as WMV, AVI, DivX, MPEG, MP4, H.264/MPEG-4 AVC, RM, MOV, XviD, FLV, 3GP, VOB (the video format used in DVD), DAT (the video format used in VCD, SVCD), and so on. It can also extract audio from video file and convert them to M4A, MP3, AC3, AAC, WMA, WAV, OGG as you want. CPU >G4/G5 processor or Intel processor, 512MB RAM or above. 3herosoft Video Converter for Mac is an ideal choice as a movie converter and a music converter. Now free download and try this powerful video converter software and to colorize your digital entertainment life. Qweas is providing links to 3herosoft Video Converter for Mac 3.4.2.0221 as a courtesy, and makes no representations regarding 3herosoft Video Converter for Mac or any other applications or any information related thereto. Any questions, complaints or claims regarding this application 3herosoft Video Converter for Mac 3.4.2.0221 must be directed to the appropriate software vendor. You may click the publisher link of 3herosoft Video Converter for Mac on the top of this page to get more details about the vendor.